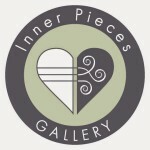 Today’s guest blogger is Cherice from Inner Pieces Gallery. She’s using her background as an educational therapist to provide some tips on reaching our most struggling learners to help them succeed. Do you ever feel like some students in class are unreachable? Even though you believe all children can learn, sometimes they arrive at your classroom door not knowing how to read at the most basic level. Despite their learning challenges, these kids are too bright to qualify for special education, yet none of your tried and true intervention efforts stick. Is there anything more you can do? As a former educational therapist, these are my favorite kids to work with. (Yes folks, I said it. Apparently I choose favorites.) You might not think I would choose the sometimes loud or overly chatty or disruptive kids, the sometimes off in la-la land, not paying attention kinds of kids as my favorites. Humor me for a moment. Students with learning challenges, the ones who are falling through the cracks, moving from grade to grade without learning how to read, whose confidence in themselves tumbles lower and lower with each passing year, are the very students we can have the greatest impact on. Sometimes, all it takes is a targeted approach to strengthening processing skills, and we can change the trajectory of their educational careers for the better. Sound like magic? It sure feels that way sometimes. Using strategies to remediate dyslexia and other learning challenges, I witnessed “miracles” first hand. The miracles weren’t only in students’ amplified ability to learn. I saw entire personalities change. Students transformed from dejected wallflowers or so-called “troublemakers” to outgoing, active hand-raisers. Confident. Capable. Happy. That’s what we want for ALL of our kids, right? While I will always recommend that parents seek out private educational therapy for their consistently struggling learners, I know this isn’t always an option. That’s where you come in. First, let’s recognize that processing skills and academic skills are not the same. Processing skill development sets the foundation for academic learning. Trained educational therapists do not focus on a child’s area of academic weakness, then practice the same activities over and over again. When the trouble lies in weak, underdeveloped processing skills, repetition only increases a child’s frustration level. Students fail, again and again, reaffirming their deep feelings of inadequacy. Instead, educational therapists dig deeper to uncover the specific processing deficits at the root of the problem. Through strategic cognitive strength training, educational therapists maximize students’ ability to learn. Even without academic intervention, cognitive intervention naturally translates to better performance in the classroom. The process, if targeted and consistent, can take anywhere from a few short months to approximately two years. If one-on-one educational therapy is off the table (and even if it isn’t), then I believe one of the best things we can do for ALL students is to learn everything we can about processing skills – what they are, signs of trouble, and how to intervene. After training educators how to identify and strengthen processing skill deficits, I was a little surprised by how grateful the teaching credential students were for the knowledge. No one was covering this in their credential programs. The classroom teachers, even the initial skeptics, saw the profound impact of simple cognitive strength training activities on their previously difficult-to-reach students. Some even said that their new understanding completely changed the way they teach. In a nutshell, processing skills involve the way we take in information through our senses, then interpret the information received. Typically, by the time children enter kindergarten they have developed strong enough processing skills to learn their ABCs and beyond with ease and confidence. Without a strong foundation in place, however, students may learn to develop compensating skills in an effort to hide any weaknesses. This strategy tends to work for a little while. Then, right around the third grade or so, learning gaps grow larger and larger, becoming much more difficult to hide. Below is a short list of visual and auditory processing skills. I’ve included only a handful of ways these particular processing deficits may reveal themselves. Perhaps you recognize them? Does your student skip lines while reading or read words out of order, perhaps words that are pulled randomly from different lines on the page? Does he reverse words, reading “saw” instead of “was,” for example? This could point to a potential visual tracking issue. This challenge shows up in all sorts of ways, from copying work from the board only one letter at a time to spelling trouble to difficulty learning sight words, poor reading comprehension, and more. Challenges with visual discrimination may show up as common letter reversals and letter identification confusion. 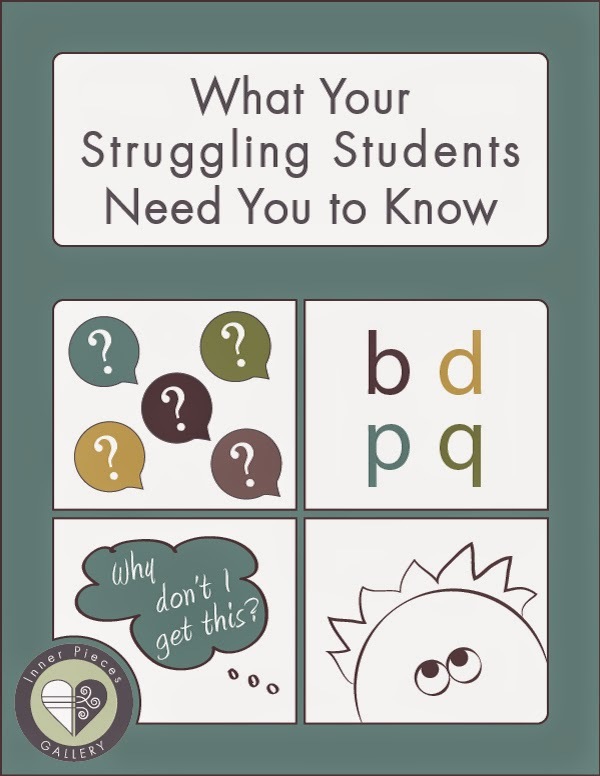 Distinguishing the differences between letters b, p, q, and d, for instance, may be difficult for students who struggle with this skill. This pertains not only to our physical body in space, understanding left from right, and being able to read a map, but it also can impact writing. Rather than writing in a straight line, do any of your students write in a slant that seems to trail dramatically down the page? Do they make errors in math equations because they don’t line the numbers up correctly? Strengthening spatial awareness may help. Please recognize that students may demonstrate the tendencies described above for multiple reasons. As you learn more about what those reasons might be, and how to help (don’t worry, I’ll get to that part), focusing on underlying processing skills puts you in a strong position to help your struggling (and non-struggling) learners. 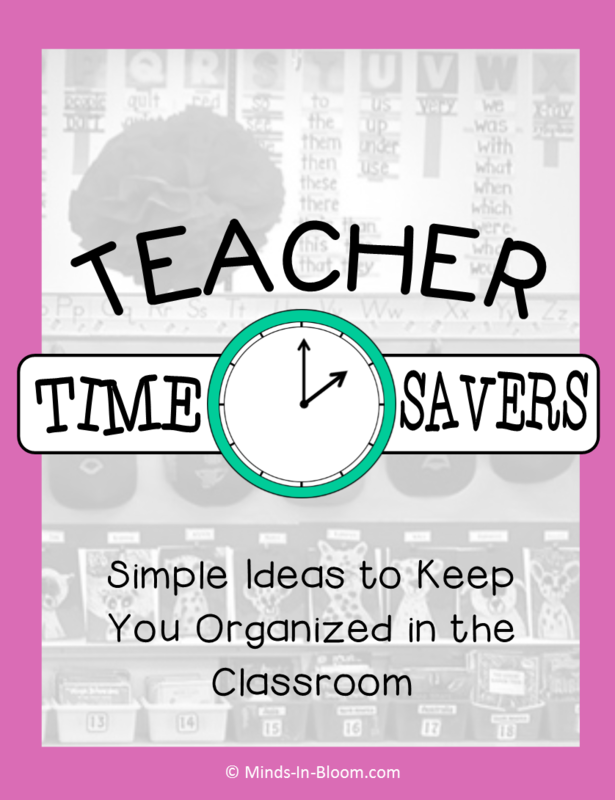 Doing so helps you provide your students with more than a temporary fix. You’ll go beyond merely helping them understand one academic concept at a time. With your help and understanding, your students will develop learning skills that last a lifetime. Activities that build processing skills are actually deceptively simple and fun! Enlist the help of your teacher’s aide, your volunteers, your parents, or your early intervention specialists. 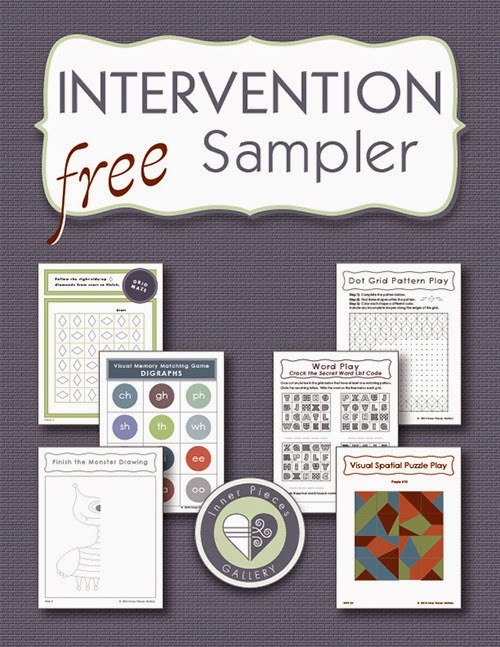 Share with them my free Intervention Sampler, a printable resource providing more information about some of the processing skills I mentioned above. You’ll learn what the skills are, what signs of weakness to look out for, and even be able to take a few targeted interventions for a test drive. Then head over to my website (link below) to find more strategy tips and tricks. 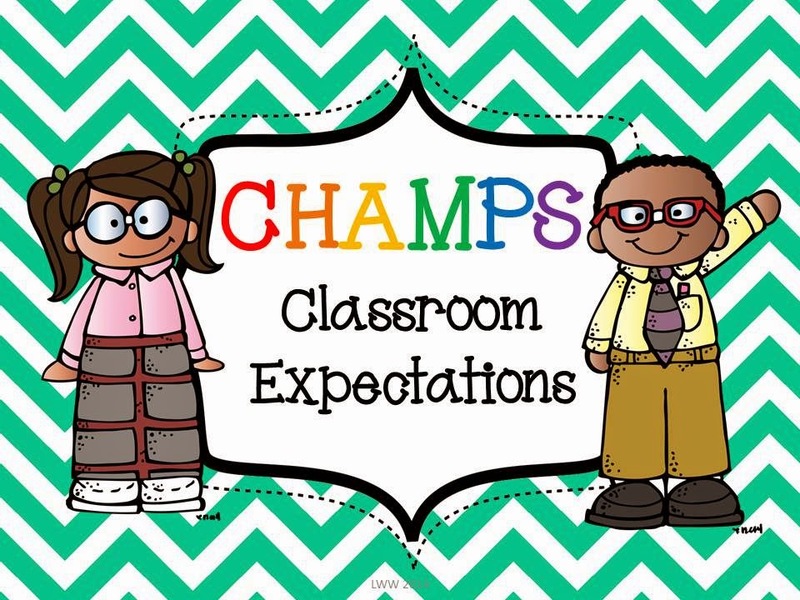 They’re designed to help YOU help your struggling students become confident, capable learners. Cherice designs Learning Ability Boosters for students in K-6. Her educational therapy experience specializing in dyslexia remediation techniques informs all of her designs, which are just as useful for gifted students as they are for struggling learners. Find her specialty materials at Teachers Pay Teachers, plus plenty of tips and fun freebies at Inner Pieces Gallery. Cherice, thank you for sharing your expertise with us! The list of processing skills and the ways they can reveal themselves is so helpful to classroom teachers, who may not recognize the signs or may misinterpret them. I'm looking forward to checking out your intervention sampler! Thanks Kiki's Classroom. Yes, so many struggles with fairly simple solutions can easily go unnoticed, but it doesn't have to be that way. I hope you find the sampler helpful. Thank you very much, David. I'm happy to hear you'll be sharing the information with your colleagues. Please let me know if you have any questions.